UPDATED Breaking News: Pastor Steve Weaver’s Blog Makes Baptist Top 200! 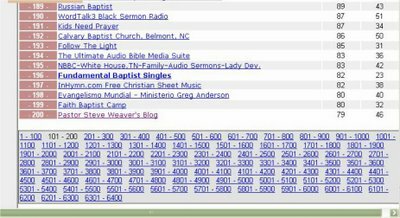 NEWSFLASH: Pastor Steve Weaver’s Blog has moved up to #200 on the “Baptist Top 1000” Directory today. The directory claims for itself the title of “The Ultimate Baptist Directory”. I am currently number 200, right behind the “Faith Baptist Camp” (yes family, that Faith Baptist Camp) website. With your help I could pass them tomorrow and be well on my way to the top 100! Whoopee!!! God is still on the throne! He takes care of His Own! Whoop dee doo. I took the little baptist deal off my site because it kept interfering eith other stuff. I would probably be like #2. So, how do we help? You Baptists are so competetive! Mentioning Faith Baptist Camp makes me think that it might be the perfect will of God to take up an offering right now. Any ladies want to put up their engagement rings for sale?